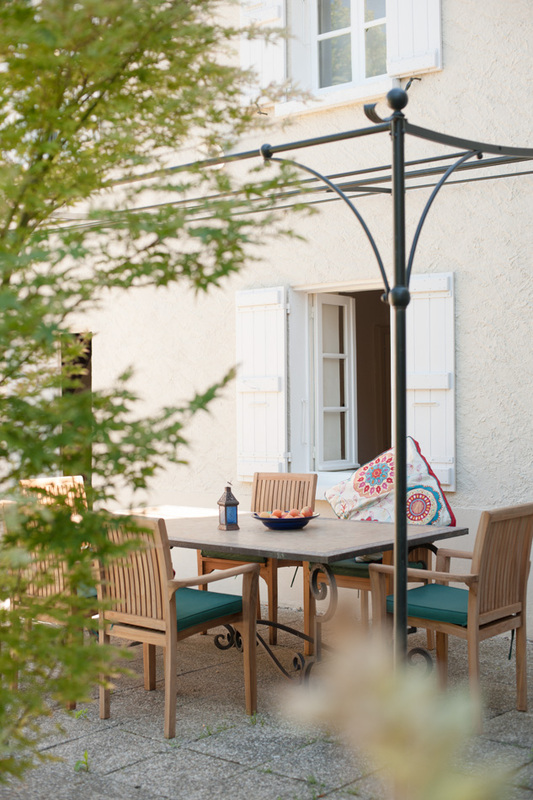 Located in the heart of the Gers, Maison Valentine is a beautiful 18th century Maison de Maître. Built for the local squire at the height of the Napoleonic era in 1779, this spacious house sits in the centre of the medieval village of Castet Arrouy close to the hilltop town of Lectoure. The Chemin de Santiago de Compostela – the ancient and well-trodden pilgrimage route – passes in front of the house as it winds its way through the French heartlands and on towards its destination in Portugal. Passing pilgrims can often be seen peering into the 12th century church that overlooks the house. old wooden spiral staircase, visitors will find 3 large double bedrooms, all with en suite bathrooms. Each bedroom houses a double bed or more, with further accommodation available from a double sofabed in the living room. The house sleeps 6-11 guests. The thick walls of the house keep it cool in the Summer and warm in the Winter when two woodburning stoves provide a glowing hearth and fragrance in the dining and living areas. The garden is a haven. Swim unobserved in the romanesque pool, eat al fresco on the patio, sunbathe on the loungers. Castet Arrouy, 5km from Lectoure and close to Condom, the Armagnac centre of France, and the market town of Fleurance, resides in an area known locally as ‘the golden triangle’. The verdant rolling landscapes are reminiscent of the English countryside – on a good day. In Summer, the roadsides are lined with sunflowers. Known as ‘the Tuscany of France’, the Gers is famous for its produce so self-catering becomes a joy. Cook yourself mouthwatering meals in our well-equipped modern kitchen or eat on the patio that overlooks the pool.